I am a huge fan of drinking wine so I am so excited to have the privilege to introduce the new wine on the block, Thorny Rose Wines, for all your holiday parties this year! Launched only a couple months ago, the Thorny Rose portfolio includes a Chardonnay, Cabernet Sauvignon, Sauvignon Blanc and Red Blend. With modern packaging, approachable positioning, and a refreshing, medium-bodied style, Thorny Rose is the perfect gift for anyone on your list. 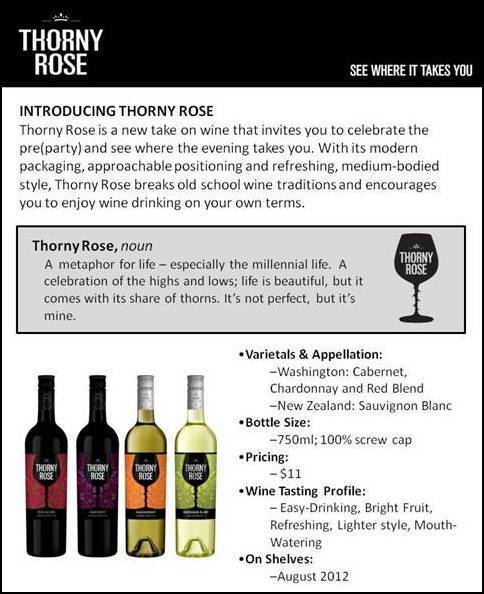 Thorny Rose Sauvignon Blanc grapes are grown in the world-renowned coast of Marlborough in the South Island of New Zealand – a region known for its fresh and lively fruit. Thorny Rose’s other varietals are made using grapes grown in the Yakima Valley, Columbia Valley, Horse Heaven Hills and Wahluke Slope of Washington. Situated on a latitude of 46ºN, the region is similar to that of the world class regions of France. The Cascade mountain range maintains a dry climate (less than 10 inches of rain a year) with its rainshadow effect, while the range’s snow melt provides the region with pristine rivers and an ideal irrigation source. Warm days followed by cool nights bring out the grapes’ natural acidity and the region’s incredible variety of microclimates allow for many different types of grapes to be grown.